There is no need to spend money on a kit to dye your Easter eggs when you very likely have all the ingredients for Easter egg dye in your kitchen cabinets. Don't be worried about limitations in color compared to the kit because the regular four pack of colors for food coloring--red, blue, green and yellow--can produce a wide range of colors. Decide how many colors of dye you want to mix for your eggs. 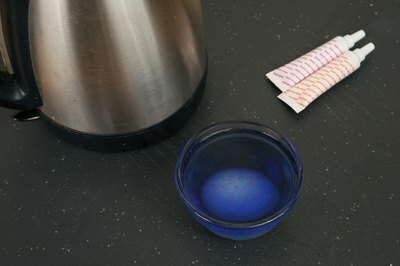 Set out that many glass cups or bowls to serve as egg-dyeing basins. 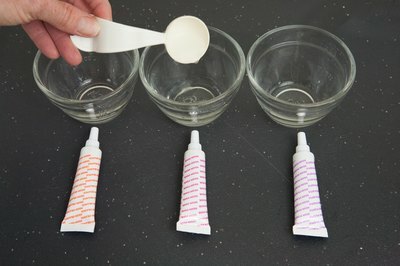 Make sure that they are each large enough to accommodate an egg but small enough that two-thirds cup liquid will cover the egg. Add 2 tbsp. distilled white vinegar to each cup or bowl. 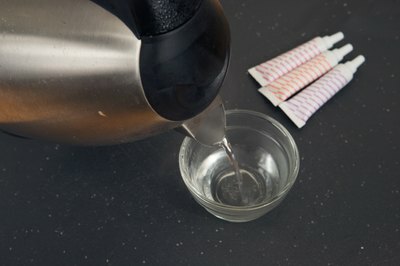 Add two-thirds cup hot water to each cup or bowl. 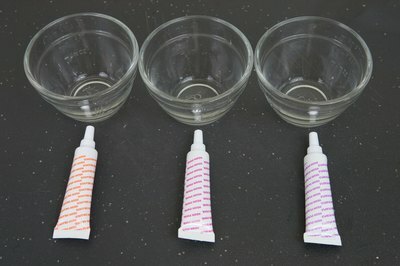 Add 7 to 15 drops food coloring to each cup or bowl until you achieve the desired color for each. Stir each. 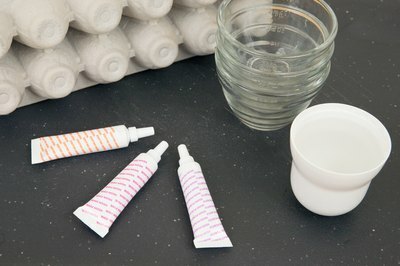 Allow eggs to soak until they have deepened to the desired shades. Move the eggs around in the cups or bowl to get an even hue. Eggs are best dyed fresh after cooking, when they are still hot. Consider dyeing eggs multiple colors by dipping parts of eggs in one color of dye, drying them with a paper towel, and then dipping them in the next color. 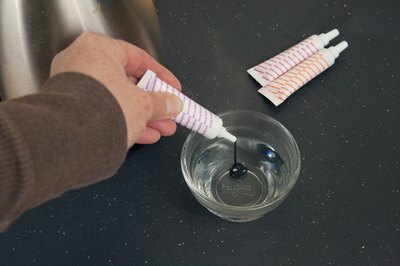 Rinse out the bowls as soon as the dyeing in done so that there is less chance of staining.